Using method: Ready to slice sandwiches and stuffed, in the middle of two sandwiches into a stuffed, hundreds die in a sandwich press, take off the broken edge and die, a lovely delicious sandwich snack is ready. It's apparently a real set of directions for a sandwich cutter manufactured in China. When posted, it usually comes with a photograph of the graying, crumpled paper on which the directions are printed in an undistinguished typeface that looks thoroughly authentic. Matt found this gem on somebody's tumblr, where it got reblogged tens of thousands of times. It was also taken up on Facebook, Twitter, Pinterest, and who knows where else, so by now hundreds of thousands, if not millions, of people have seen this supreme specimen of Chinglish and made priceless comments such as this one: "I HAVE BEEN LAUGHING AT THIS FOR 5000 YEARS". Yet, before Matt, I haven't noticed anyone who expressed any curiosity about how these Chinglishy directions could have come about. This monumentally understated, and itself not entirely explicable, critique usually accompanies the Chinglish directions, which only adds to the mystery, and (for an inquisitive soul like Matt) frustration surrounding the sandwich cutter from China. I'm not so obsessive compulsive or vain (or foolish) as to aim at a complete reconstruction of the original Chinese text from which the Chinglish might have originated, but I will at least be able to say with a fairly high degree of confidence what brought about the main error in the directions, namely, how a sandwich cutter can cause people to die, even in the hundreds! The first part, "Using method", is almost certainly from shǐyòng fāngfǎ 使用方法. The last part, "a lovely delicious sandwich snack" is so transparent and charming by itself that I won't even bother to back translate it into Chinese. From here on, I'll just focus on key terms. "Sandwich" in Chinese is sānmíngzhì 三明治. That's a transcription, of course, but it also can be rendered literally as "three enlightened rule(rs)" (in our private language, my wife and I would always refer to a sandwich as a "Yáo Shùn Yǔ 尧舜禹" [the names of three mythical emperors]). "stuffed", which occurs twice, probably comes from xiàn 餡 and refers to the filling which is put between the two layers of bread. "take off the broken edge" refers to removing the crust that has been cut away after the sandwich has been pressed. Now, for the pièce de résistance, what everybody has been dying to know, "die" refers to the mújù 模具 ("mold; matrix; pattern die; die; pattern") used to cut the sandwich into different, fanciful shapes. All right, now what about the hundreds? If you google on "sandwich cutter" or better yet "sandwich cutter shapes" (you don't even need quotation marks), then go to images, you'll see that there are hundreds of different sandwich cutter "dies" available. I'm hungry for a "three-enlightened-rulers", so will head off to Panera for a late breakfast and post this to LLog. So in essence, this is the same ambiguity as in the Bloomberg headline. When reading the Bloomberg headline, some people saw "rules" as a verb, others saw it as a noun. Here, some people will see "die" as a verb, when it is intended as a noun. I did more or less immediately twig to the right sense of "die" (even as I giggled). A little preposition (say, "of") would have defused the mess and the humor. I think part of the reason "Hundreds die in sandwich press" tickles the funny bone is that it sounds exactly like headlinese. Makes one imagine a European-football-hooligan-type incident in which would-be patrons of the latest trendy luncheon outpost come to an unfortunate and untimely end. Or possibly a riot at the Royal St George's Golf club? The phrase "hundreds die in a sandwich press" made me think of the hundreds and thousands sandwich. A sandwich press might indeed "kill" (melt) hundreds of these "tiny balls or strands of multicoloured sugar" (Wiktionary definition). 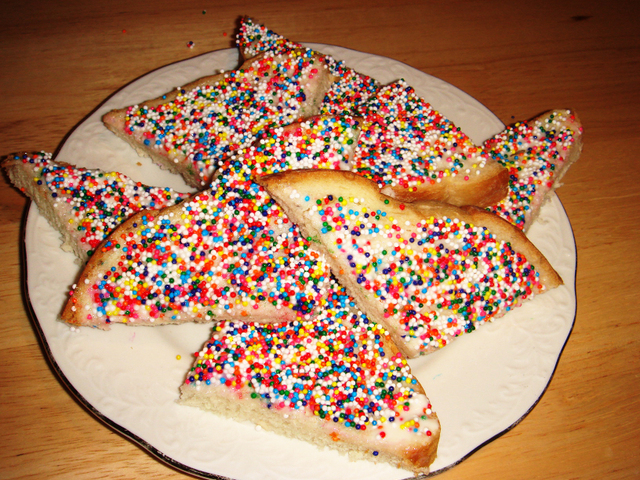 This picture gives a better idea of what the hundreds and thousands sandwich looks like in Australia (where it was, apparently, invented). In other words, compared to the picture in my recipe link, they are ball-shaped, not strand-shaped, and they are sprinkled more liberally. The mystery in Agatha Christie's short story "The Tuesday Night Club" turns on the ambiguity of that phrase, "hundreds and thousands." The police take the appearance of the phrase on a blotter as a reference to the hundreds and thousands of Pounds that one suspect would inherit. Miss Marple, naturally, spots the kitchen reference to the sugary sprinkles of the dessert topping. How to use: Get sandwiches ready. Press the sandwich cutter, one of hundreds available, into the center of the sandwich. Remove the cut edge and the cutter. Enjoy a ““lovely, delicious” sandwich. So I guess I’m wondering, if that’s the intended meaning (as it appears to be), why would the instructions for a specific sandwich cutter say that? (If anything, it’s more of a marketing claim—“Choose from the hundreds available!”—and even that seems a bit of a stretch.) Or do I have the intended meaning wrong? Presumably during the manufacturing process, the die is cast. I see that "hundreds and thousands" are also known as "nonpareils" or "jazz drops" (UK). When I was a small child, if you asked your mum for a snack, you would either get cinnamon toast, or bread and butter and hundreds and thousands. I'm not sure Jazz drops refers to hundreds and thousands themselves. Searching for Jazz drops sweet shop brings up results of the term being used to refer to chocolate buttons covered with hundreds and thousands. As those are often called Jazzies, I suppose a few people may have used the term jazz drops to refer to the bits that have dropped off them. The last two steps are clear enough but it's unclear exactly what the first three refer to. I presume at least #1 refers to making the sandwich so either #3, #4 or both must refer to the operation of the sandwich cutter. On it's own #3 could perhaps be interpreted as operating of the cutter but when #4 explicitly refers to the die and press of the cutter it seems more likely that's the step where the sandwiches get cut to shape. Which is equally amusing carnage but easily understandable as the act of pressing a hand cutter into a sandwich. I know no mandarin so I can't speculate on translation, but that would be my suspicion of the intended meaning of the instructions. For someone who knows no Mandarin, I think that your rearranged version is remarkably good, but did you omit the "hundreds" on purpose? @Jeff W: I think probably that this is just one more sign that the Mainland Chinese are still getting the hang of commercial writing conventions. I have come across "nonpareils" to mean the tiny round candies, but in my American idiolect, the word should only refer to the chocolate (or other flavored) drops with the those little balls ("hundreds and thousands" in other varieties of English, apparently, although not in mine) attached. So that sounds like the same thing as "jazz drops"—although that's another term I've never heard. The balls themselves are generally just called "sprinkles" in America. Oblong ones are also usually sprinkles, although in New England, they are "jimmies." Thanks, that was sort of my thinking also but I would have thought that somehow there would be a kind of pragmatics constraint against it.